The main operations objective in the field of fuel power, including increase in resources of fuel for motor transport due to use of fuel alternatives which, unlike oil, are characterized renewable and unlimited source of raw materials. Gasoline is the most widely known mix of hydrocarbons, but nevertheless, about its properties are known very little. This results from the fact that pressure from competitors forces producers to let out quite suitable product for use. And if the product is quite suitable, buyers cease to be interested in the reasons of its suitability. It is the most qualified and the road the energy carrier. For its receiving there is a use of technological difficult complex processes of primary and secondary oil refining at oil refinery plants and also various additives and which are providing compliance to modern requirements to structure and quality of this type of motor fuel. It is recommended for improvement of a number of operational properties, such as providing ethanol mixing with gasoline. Ethanol mixing is applied on motor transportation; it is enough to add of 10% of ethanol additive to increase car power. Small concentration of ethanol in fuel is not significantly influences operation of the engine, but with increase in its concentration to 85% be required power supply system alteration. Considering that biofuel more strongly is coming to our life, the world automotive industry adjusted release of cars which can work, both at pure gasoline, and at gasoline mix with ethanol in any ratio. Ethanol is an important component of 138-billion gallons of gasoline. Ethanol mixing with gasoline increases octane number reduces fuel price and accompanies observance of environmental standards and fuel profitability. Bioethanol is the most widespread and renewable fuel as it contains in more than 90% of gasoline, in the world market. The majority of ethanol is made from corn, but it also can be received from other types of raw materials, such as agricultural waste, sorghum grain, wheat, barley and potatoes. Biofuel has several of advantages, the most important is ecology. The researches of ethanol mixing,exhaust shows that oxide of sulfur in air won’t appear in general. The content of oxides of nitrogen is 15% less, and soot — for all 60%. Thus the volume of carbon dioxide in air it is allocated, as much as plant consumes during the life. In 28 days all chemical elements to which biofuel breaks up, become part of an ecosystem and organic components of water and the earth. Biofuel — is a renewable natural resource, unlike oil and gas. In many countries ethanol mixing with gasoline is made in different proportions. The fuel containing ethanol, is marked by a letter E and figure which means percent of the content of alcohol. For example E10 is a gasoline with ten percentage additive, E85 – ethanol with fifteen percentage of gasoline. Strictly speaking, E100 are able to afford to fill in a tank only in the warm countries – ethanol has one essential shortcoming: at low temperatures the engine on alcohol is badly started. 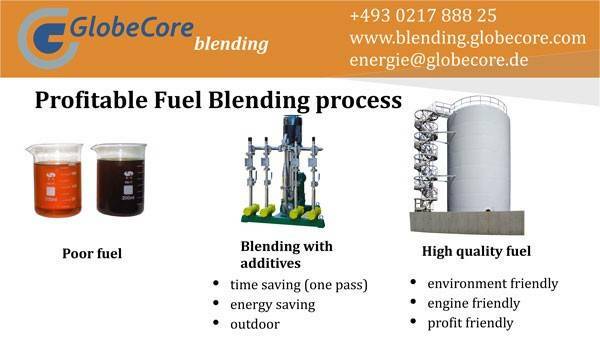 The GlobeCore Blending company is anticipated in production of ethanol mixing systems. Advantage of offered installation is that applying an injection method and hydrodynamic blow, besides qualitative mix of bioethanol and usual gasoline, it is possible to raise also octane (metane) number of fuel thus stratifying of the received product doesn’t occur within 180 days, (is guaranteed). Modern hydrodynamic mixing installations proved in commercial operation as economic, exact and stable means of production of high-quality motor fuels and liquid mixes with optimum prime cost.